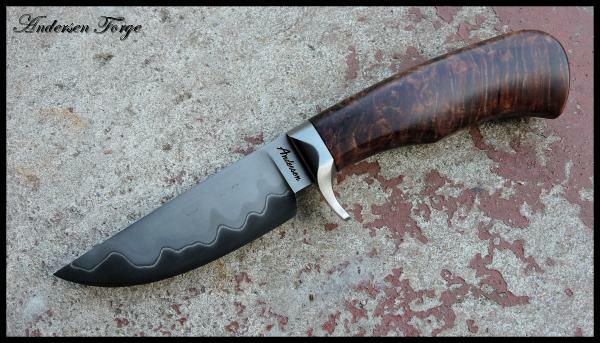 This particular knife sets a bit of a land mark - it will more than likely be the last knife I make for a customer using a block of Stabilized Black Ash Burl from my ol' stompin' grounds in northern Minnesota. While living there I was able to acquire a really nice Black Ash Burl that I dried and had stabilized. I'm about out of those. 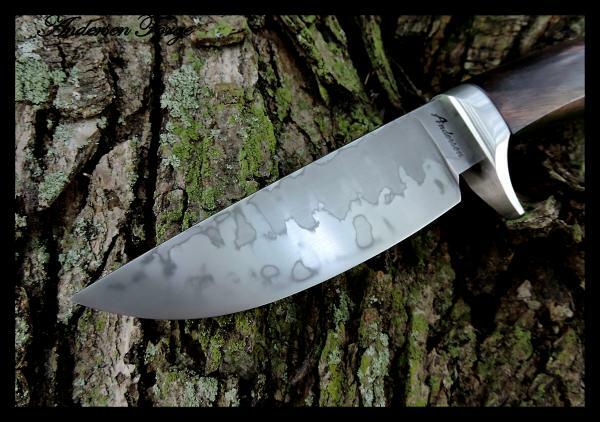 This knife was designed around a platform I developed about 10 years ago named after a lake in the Boundary Waters - White Iron Lake. This is my White Iron hunter. 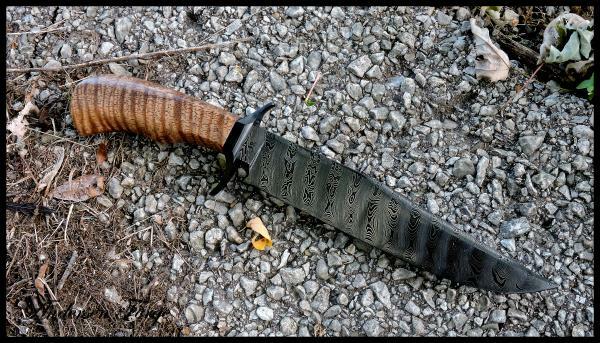 The blade is 1095/410 San-mai and the knife is built in a Take-Down configuration. 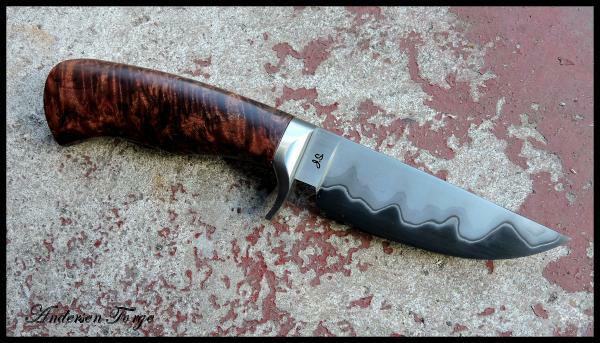 This was a rewarding knife to make - it was for a friend. 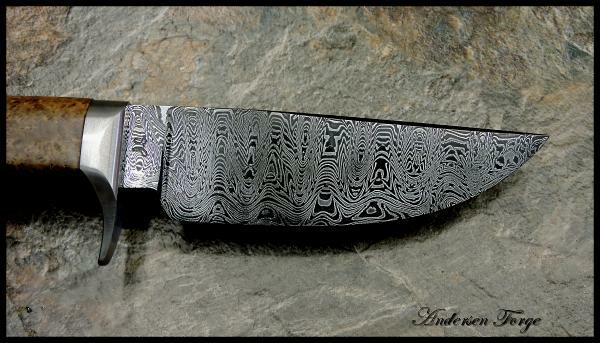 The Damascus is a wonderful example of Laddered Crushed Ws. A bit time consuming - but what Damascus isn't? The Black Ash Burl is some I harvested from where I was living in Northern Minnesota and the knife was made for a friend who is a daughter of one of my neighbors. A fitting tribute to us both! Full take-down and hot-blued blade. Hard to top this one. This exposes the channels of the burl along the sides - which look like "lace". A unique display of a fabulous material. The knife is built in a take-down fashion for ease of maintenance. 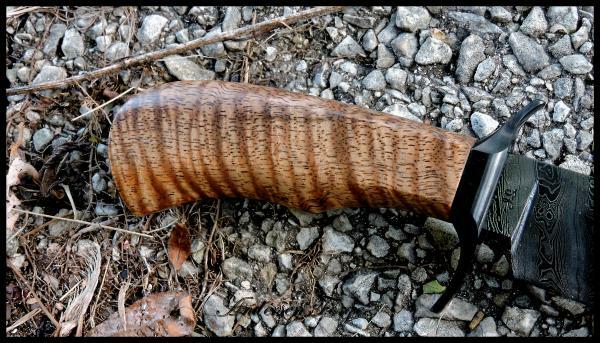 A 416 guard and wet-molded sheath complete the package. Now living happily in Colorado! A pretty spectacular example of my style of Hunter right here. 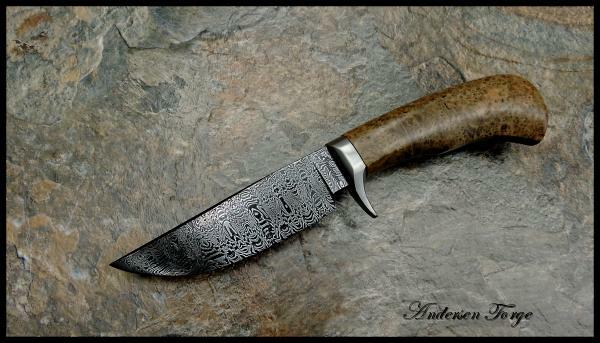 This Hunter was forged from a billet of Single Twist Damascus which was then hot-blued. 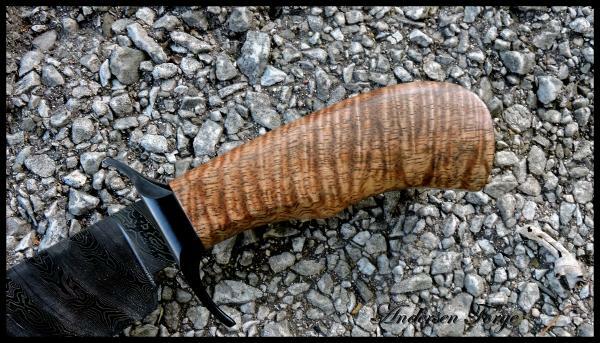 I got this block of Stabilized Maple Burl this past June at the Blade Show in Atlanta. I could not pass it up! 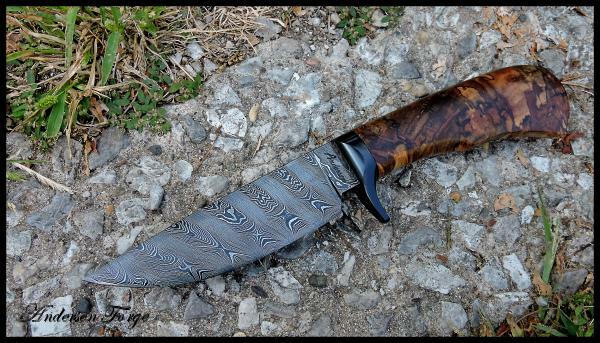 The take-down assembly was used for the construction of this knife which also allows me the freedom to Hot-Blue my Damascus as well as the mild steel guard. Overall, a very striking specimen. 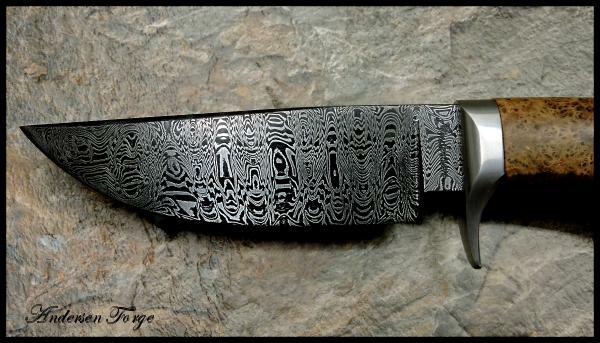 I really enjoy making Single Twist Damascus with my mechanized Mr. Twister!! It allows me to make a ver, very precisely controlled twist in a single heat. This allows for great consistency in the final steel. 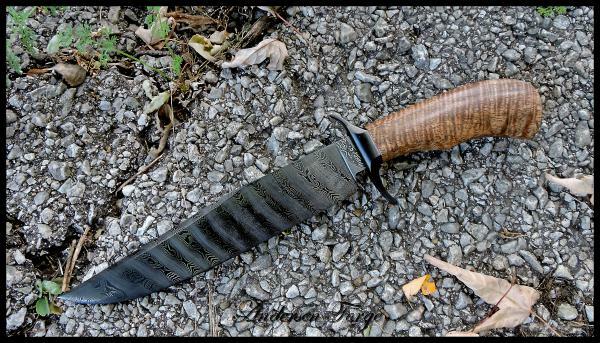 The Damascus on this Fighter was hot-blued along with the Take-Down assembly "S" guard. The Stabilized Curly Mango is extraordinary. And everyone who has handled the knife mentions how light it feels in the hand! With sheath, Certificate of Authenticity and zippered case. Here is one I just completed for a good father. 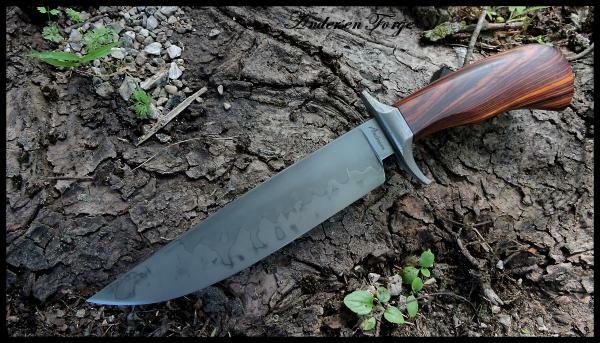 He commissioned this knife to give to his son who is training on our USA Olympic Shooting Team! 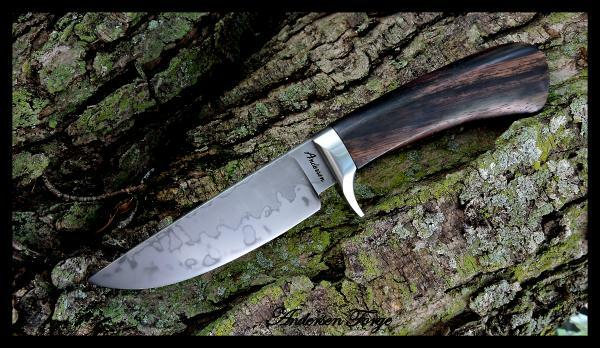 I forged this blade from a 1 1/8" round bar of W1 tool steel and clay processed the blade during heat trreatment to result in the distinctive differential hardening hamon. 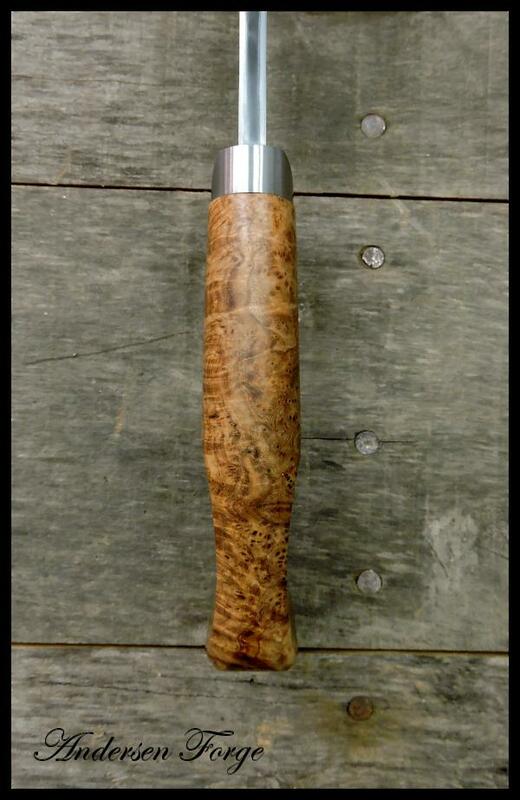 The handle is from a fabulous block of Desert Ironwood. All built in a take-down assembly. 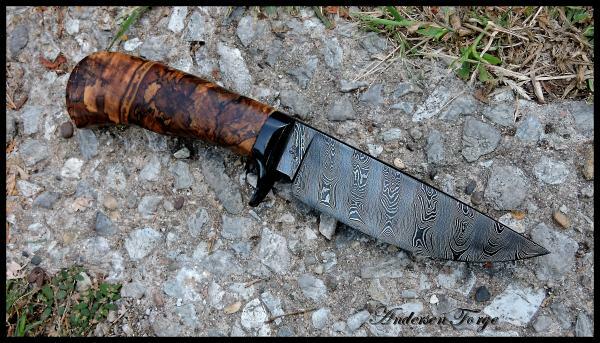 I was honored to make this knife. 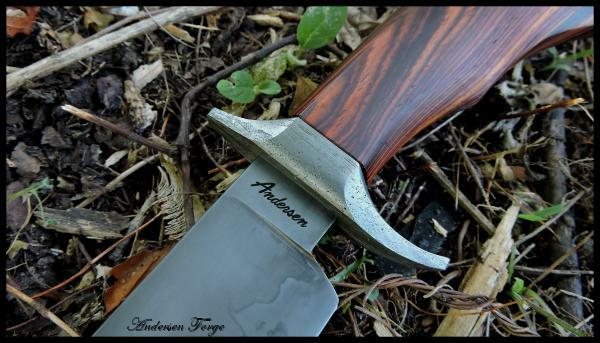 Another fine example of a sweet little hunter from Andersen Forge! 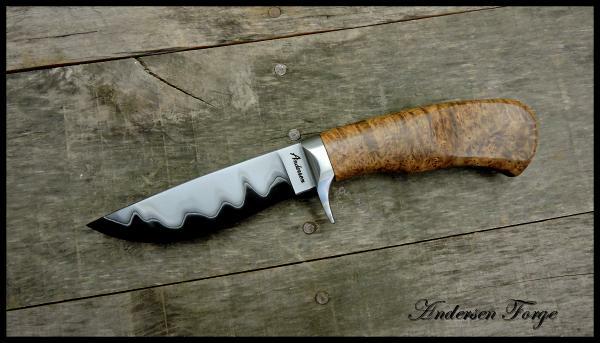 One of the best performing knives I ever made was just like this one - forged from a 1 1/8" round bar of W1 Tool Steel. 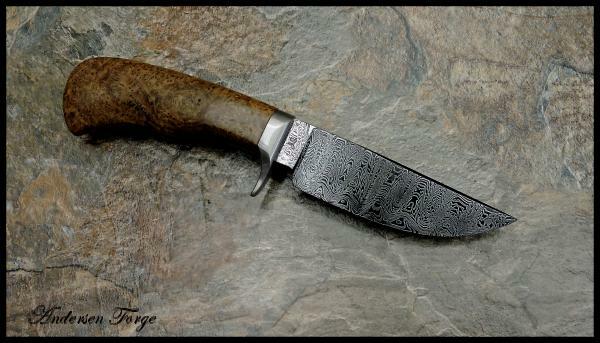 I also clay processed this blade to display the differential hardening with the distinctive Hamon. 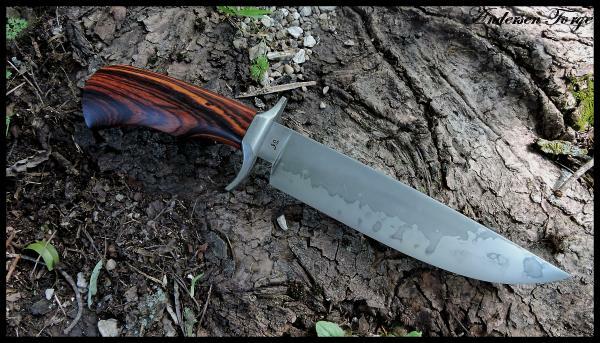 The knife was built in a take-down assembly style with a 416 guard. 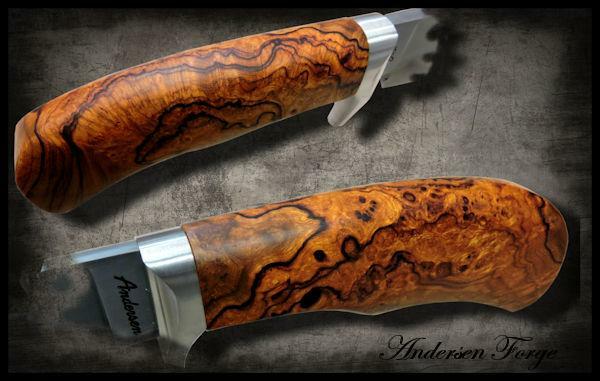 The handle is a really dark and richly figured example of Cocobolo. 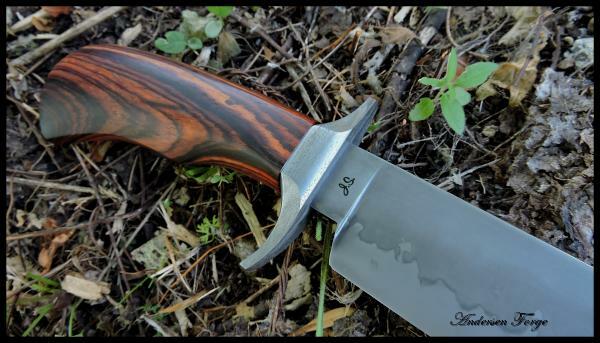 This knife should easily last someone a life-time of adventure and leave enough for the next generation! This fellow has been very patient for two years waiting for his knife! 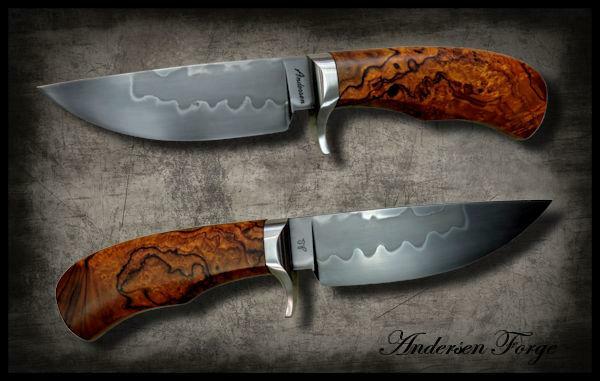 The blade was heated differentially with the application of clay to acieve not only the differential hardening but it also reveals the distinctive 'hamon'. The take-down hardware is 416 stainless and I used the last piece!! 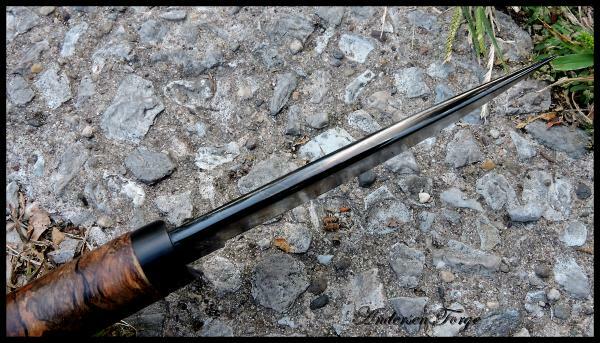 of Macassar Ebony I have for the handle. If you want more from a hunter - I don't know what it would be. 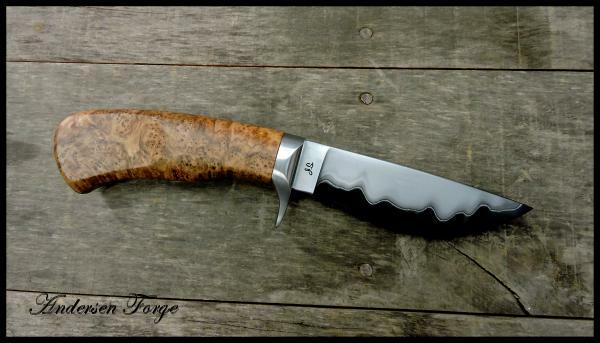 I made this knife for a very, very good customer of mine. G.D. is an avid camper/hiker/outdoor enthusiast. 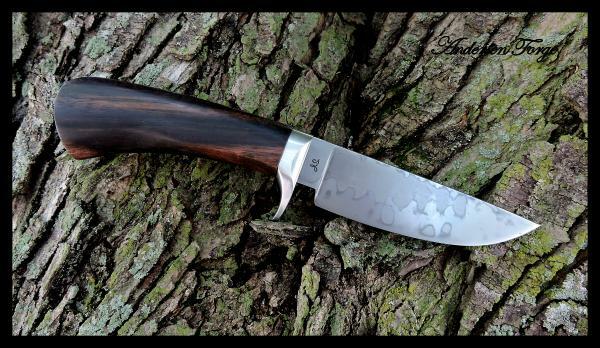 He wanted a larger style knife to take care of the 'big' tasks that may come from more being able to enjoy his outdoor adventures. I've made a few pieces in the past that I named the "Ranger", and this was his chosen style. 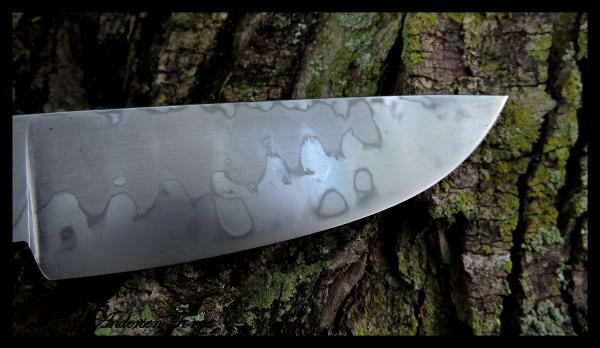 I forged the blade from some large diameter W2 tool steel and heat treated the blade using differential hardening which results in the distinctive hamon. For the guard - deeply etched 1903 wrought iron. The hanlde material I supplied is Cocobolo. 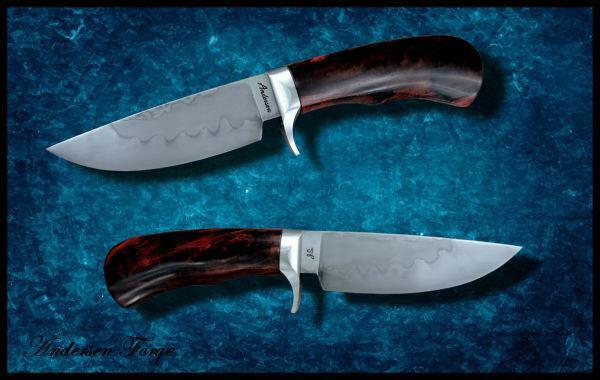 Cocobolo is very, very tough and should be able to handle anything Nature throws back at my friend.